UPDATE: New photos were added on 12/13/2011, and the recipe now includes a link to a printable version. Did you have a favorite candy bar when you were a kid? I had a few that I preferred, but the best ever to my mind was a Twix. That’s why I was determined to get these cookie bars right even though it took a couple of tries. This all started when I read the recipe for millionaire’s shortbread in the Baked book, and it sounded straightforward enough. The concept is exactly what you see here which is a layered bar of shortbread, caramel, and chocolate otherwise known as a homemade Twix candy bar. I had a caramel disaster in that the sweetened condensed milk which cooked in a double-boiler (for more than twice the suggested time) never became caramelly or thick enough. Plan B was using store-bought dulce de leche, but that didn’t work either because even chilled it isn’t firm enough. But, then I remembered the chocolate caramel squares recipe I had mentioned from The Golden Book of Baking , and its caramel layer is built in a slightly different way. After comparing the two recipes, I ended up mixing and matching and adding my own touch by keeping the chocolate glaze from Baked and using the caramel from The Golden Book of Baking and sprinkling the chocolate with French sea salt. To clear up all this confusion, I’ll include the final, complete recipe below. The shortbread cookie base was made first, and the two books differ in that the Baked version is richer with a little more butter and an added egg yolk. For my final version, I went with the more basic shortbread with no egg from Golden Book of Baking. While the shortbread cooled, the caramel was made. In the successful version, butter, sugar, light corn syrup, and sweetened condensed milk were combined in a saucepan over medium heat. It was stirred while the butter melted, then brought to a boil, reduced to a simmer, and stirred while simmering for about 20-25 minutes. The recipe suggests five minutes, but at that point it wasn’t caramel yet. I was not willing to accept failure number two, so I continued cooking until it looked right. From time to time during the 25 or so minutes, I would drop a little caramel onto a white plate to see the color clearly and how it set up at that point. 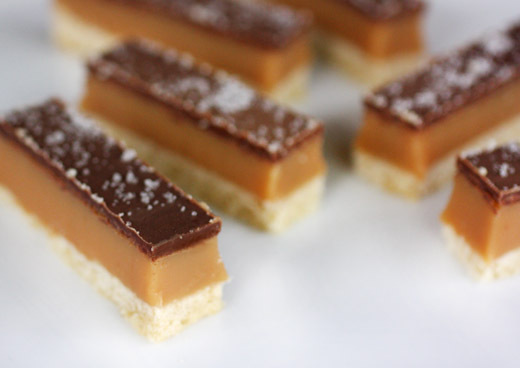 When it looked like the filling in a Twix bar, the caramel was poured over the shortbread and was left to cool. Then, the chocolate glaze was made with melted chocolate, corn syrup, and butter. Once melted together and smooth, that combination was poured over the cooled caramel. Last, I sprinkled sea salt on the chocolate before it set because I’m addicted to doing that with anything involving chocolate and/or caramel. So, finally, after testing, failing, tinkering, and persevering, I did produce what could be called a homemade Twix bar kind of cookie. The three steps can easily be spaced out over two days, and the steps are simple now that I know what works. I did store the cut bars in an airtight container in the refrigerator to keep them firm, but they are solid enough to remain at room temperature and would travel well. Now that I’m happy with this version of a Twix, I may have to move on to trying Michel Richard’s adaptation of a Kit Kat. -Pre-heat oven to 325 degrees F (170 degrees C) and line a 9-inch by 13-inch baking pan with parchment paper. -Combine flour, baking powder, and salt in a large bowl. 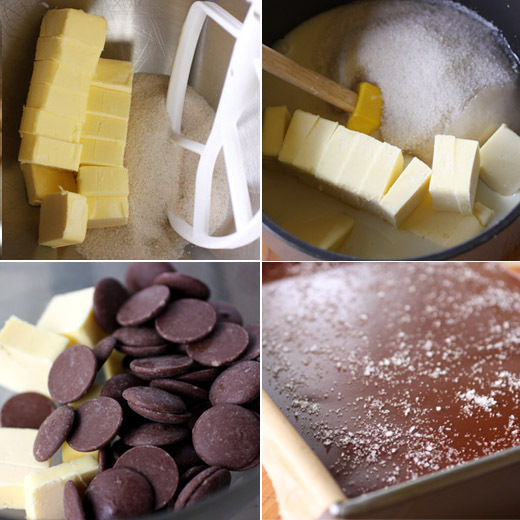 Beat butter and sugar in a mixer on high speed until light and well-combined. Turn mixer speed to low and slowly add the dry ingredients. Place dough in the prepared pan and press into an even layer. Placing plastic wrap over the top and pressing with a flat-bottomed glass helps to spread and flatten the dough. Bake for 15-18 minutes or until golden. Cool pan completely on a rack. -Place butter, sugar, corn syrup, and sweetened condensed milk in a medium saucepan over medium-low heat. Allow butter to melt, and stir to combine. Raise heat to medium-high and bring mixture to a boil, then reduce heat to medium-low again to maintain a simmer while stirring constantly. After ten minutes or so, you may want to switch to a whisk if the butter seems to be separating. For this step, the time could vary a lot depending on the heat of your burner, so watch carefully. The mixture should become a light amber, caramel color, and it should thicken a bit. You can drop a small amount onto a white plate to check the color and consistency while it's cooking. Mine cooked for about 25 minutes. When it reaches the desired color and thickness, pour mixture over shorbread, spread evenly with a heat-proof spatula, and allow to cool completely. -In a large, heat-proof bowl, combine chocolate pieces, corn syurp, and butter pieces and place over a saucepan of simmering water. Cook, stirring constantly, until melted and well-combined. Remove from the saucepan and allow the chocolate glaze to cool for 30 seconds. Then, pour the glaze over the cooled caramel and spread evenly with an off-set spatula. Allow the glaze to sit and cool for a few seconds before sprinkling with coarse sea salt. -Cut into narrow bars and serve with a little nostalgia on the side. You're killing me. I need these now, with my afternoon coffee. Can I come over? Please? Cripes, I could never bake these as much as I wanted to because I'd have to keep them all to myself. Twix are some of my favorite candybars when I was a kid and these beauties sound incredible. Wow! Those are absolutely incredible! I am a big fan of the sea salt with caramel and the shortbread crust just makes the whole thing perfection. I love anything caramel! You are a great baker! My favorite candy bar was Take Five, still is. These turned out beautiful. Those look so scrumptious! A real temptation! I am sending this link Lisa over to my friend in Dallas. She just made her first batch of caramel and I know she will want to try this fabulous recipe you have made...there goes my sugar high! Oh - these look soooo much better than Twix......you sure did get it right! 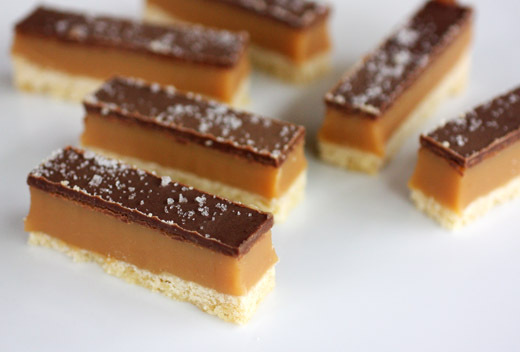 Millionaire's shortbread is very popular here in the UK, you have outdone yourself here, these are just beautiful. You really had me at "shortbread base"... these look wonderful. And really, who can argue with all that caramel? yumyum! i love millionaires shortbread cookies! this looks great - its on my list of to-dos and believe I will do. I lost a game of Trivia on a cruise because no one on our team knew what a Millionaire's Bar was/is. Your bars look amazing! I know I'd never forget what a Millionaire's Bar is if I'd seen yours first! If I come knocking at your door this Halloween, will you let me have a few of these treats? Way better than those packaged Twix! As you probably know, I find the combination of chocolate and caramel totally intoxicating. Add sea salt in the mix and I'm done for. Thank for for persevering for the rest of us! How did you get such perfect looking bars? Is that the result of them being refrigerated? Dana: You're too kind. They were refrigerated before I cut them, but the layers are stable enough to remain at room temp. wow-these are so beautiful. and look utterly delicious. maybe you could be my pastry chef? I am SO making these. I'm not kidding. I'm making these today. I have all of the ingredients. LOVE LOVE LOVE! I'm totally down with trying the kit kat recipe, too! I always wanted to get them at his restaurant in DC, but never wanted the calories! Oh my Lisa, they are sinfully good! Tempting ... tempting! Waw!! Now, this is so lovely,...pure indulgence, Lisa!!! Very rich & I so want it now!!!! MMMM,...GRAND! While I usually steer away from sweets - that looks amazing!! Thanks for the recipe. I am going to surprise my husband with them, as this is his favorite candy bar too! These are Twix for adults. No doubt, no doubt, no doubt. Wow! Homemade Twix bars? Fabulous, Lisa! I love chocolate and caramel and these are too luscious for words! Twix is my favorite too, so these are right up my alley and so pretty! Just saw this picture on Foodie View and came right over to get the recipe. Gorgeous and love the sprinkle of salt! Can't wait to try it. How fantastic they look. So elegant and not a kiddo twix. lisa thanks so much for this recipe, this are my favorite cookie bars, and finally i can cook them in my house..
im typing you from panama, :), i know you posted this long time ago, but now im going to keep following your creations. Do I need two 14 oz. cans of sweetened condensed milk or just one? Anonymouse: Yes, two cans at 14 oz each. Lisa, do you use salted or unsalted butter for this? Allison: I use unsalted butter. Lisa, these are the best cookies EVER. I snagged a couple of them at Carla's swap and was SO SORRY I didn't take more! Do you refrigerate these at any point during the making process? And do you store them room temp or in the fridge? Thanks!!! Anonymous: I have refrigerated after adding the caramel layer to speed up the cooling time, and I usually store them in the refrigerator after cutting them. They do fine at room temp, but when it's warm and humid here, I put them in the refrigerator. Lisa, I made the bars and loved them. Do you know if I can freeze them for later use? The recipe made so much, I cannot possibly eat them all. Cayla: Yes, I have frozen these before. I let them thaw in the refrigerator. The chocolate may take on a slight greyish bloom after freezing, but it still tastes great! How many bars does this recipe make? It looks absolutly wonderful! I didn't include a quantity because it really depends on how you cut them. I cut narrow bars and had about 36 pieces. I just made these and followed the recipe to the letter. They are perfect! We are having cookie wars at work this weekend and I'm sure to win with these!